“Patty & I have been living in our new home for almost a year now. We are still settling in, believe it or not, but we really like the house and are extremely pleased with the work that you & the Trillium Team did on it. There are so many decisions that you coached us on and for which we are pleased with the results. (From just the insulation alone we are already saving a lot of energy and money; the electric bill for the house is only a little higher than the now unoccupied condo). We are very glad we contacted you for this job!” - Bruce & Patty B. "We purchased an old (tear down) ranch house, and hired Trillium Architects to design a modern house with the existing footprint. We wished to build a modern, energy efficient home with clean, aesthetically pleasing lines. We also wanted a house that would sit well in its natural environment and surrounding neighborhood. What we got at Trillium was a highly talented, thoughtful and pragmatic team of architects and support staff. They listened carefully to our general dreams and specific ideas, then created a plan that not only met but exceeded our expectations! Trillium Architects have a very strong, highly developed sense of design, yet they were very open to our ideas and suggestions. The scope of our project required an exhaustive and exhausting number of decisions. 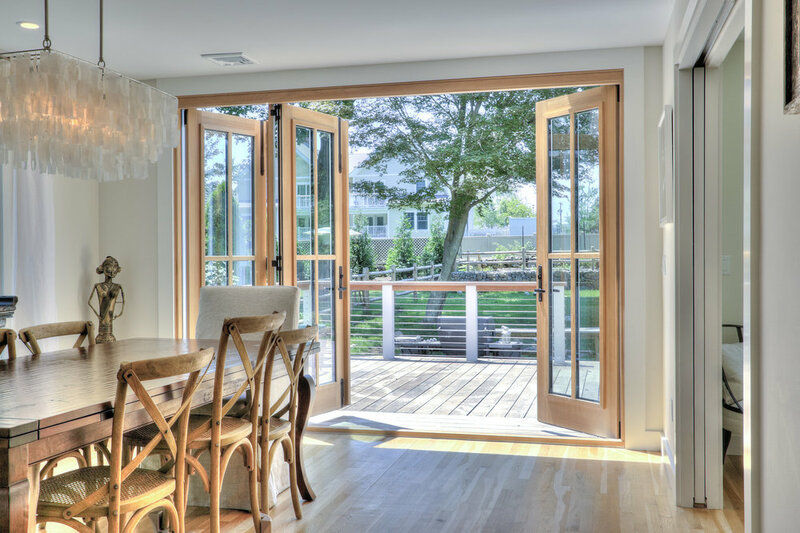 From floorplan to siding, windows to roof, from deck rail to shoe closet, Trillium kept us focused and patiently helped us to make the right choices. One thing we DEEPLY appreciated and respected was that while they were happy to take on board many of our ideas, they were tactful - but direct - when steering us away from any impractical or poor ideas we brought to the table! It was reassuring to know that if we lost sight of our goal, they never did!! On the technical side, they are precise and thorough. Tradespeople received clear and accurate working drawings. Paperwork submitted to the building department was detailed and handled efficiently. When it came to budgeting, they were very thoughtful in helping us prioritize where funds were allocated. "Trillium was contracted by the Taft School to design a passive, energy efficient home that would be at the highest standards for green homes in the United States. The home also had to meet local historic district requirements, while also being an aesthetically pleasing home for a faculty family. The home will also be used as a teaching tool for the students at Taft, which has 600 students, grades 9-12, from 35 states and 35 countries. As an insulation contractor who worked on many of Trillium's projects, we've always found Elizabeth and her team a pleasure to work with. Her blueprints were detailed and her plan to tackle the thermal envelope is always thoughtful with a focus on practicality, longevity with a touch of uniqueness. It's clear that Trillium takes great pride in their work and goes the extra mile to ensure that not only her clients, but also the contractor and subcontractors working on her project have a clear and effective vision to work off with. As an insulation contractor, we wish more architects were like Trillium! "They hit it out of the ball park!" Trillium came up with a beautiful and unique solution to our renovation needs and found the staff to be incredibly responsive and helpful. We have recommended them to many people without hesitation. We cannot thank you enough for your help in designing and building our home. Our home posed so many challenges – zoning regulations, old age of house, etc, etc – but you never said anything was impossible. Now that we have lived in the home for almost 10 months, we can truly say that you designed the most comfortable, beautiful and energy efficient ($20/ month electric bills!!!) home possible. Thank you so much! "Project is ongoing difficult renovation of a historic, mid-century modern house. Trillium Architects was essential in successfully solving the many, unexpected problems that revealed themselves during construction. Particularly appreciated prompt and patient response to questions, commitment to deadlines and budget, and their respect for the ego and work of the architect involved. We were totally impressed with how well they listen to what we wanted, designed our Net Zero home around that, and built us the most fabulous house we could imagine. Trillium designed a new "green" house for us that was completed in 2010. We are so thrilled with how it came out. Just beautiful, functional, comfortable, and very environmental (like all their work!). And they are such nice people to work with--we feel like we are part of the family. The house (in the ad) looks beautiful. But let's talk about my house. I don't know how much Jill has told you, but it's great. First, obviously it's great to be out of the trailer, but it's even better to be home. Great layout. Great house to have the boys grow up in. And energy wise... We turned the heater on once in the winter. The wood stove heats this whole house, with one load. We stuffed it twice one time, used the air handler to circulate the warm air, and got the house to 85. That was obnoxious. One morning it was very cold (for here). The house was 68. Other than that, it never went below 70. The foam insulation guy told me lights and body heat would heat this house, and he was correct. We used the air conditioner once so far. It's been very comfortable. 80-83 with fans, but when it's 100 outside, that's nice. I'm still afraid to use the air conditioner because I don't want to know if it's oversized (it will upset me). With the PV panels and adjusting some things (use the dishwasher and other appliances during the day to offset running backwards because SDGE is weird), we have next to nothing for an energy bill. Considering we're all electric, to pay the minimums is cool (even though it pisses Jill off). Thank you again. I love our house. We always had it in the back of our heads that one day we might want to build a house, but never got that underway. Thanks to a rouge back country wildfire that headed into suburbia and took out 1200 homes, we ended up having to build from the ground up, and chose Elizabeth as our architect. She also started from the ground up with us - talked about positioning of the new house and took all of our ideas into consideration. We truly had a DIY home (self-built) and Elizabeth supported us the entire journey, answering stupid questions, researching everything, and holding our hands for the better part of 2 years. The layout fits our lifestyle perfectly. Elizabeth took the time to draw it to our needs, then redesign, refine, and refine again as we lived with the plans and considered the final home. The final result is here! The house is icf construction - Arxx brand insulated concrete forms filled with steel and concrete. The huge thermal mass moves temperature very slowly, so it is very comfortable to live in. We also used foam insulation in the attic ceiling and have an unvented attic so the entire home is a sealed envelope. This past winter we turned the heat on one time to get the chill off. Otherwise we used the wood stove to heat the entire home - one load of wood with the air handler on to circulate the warm air heated the whole house. (air intake positioning is perfect!) A few times we stuffed it full twice, and the house ended up at 85 degrees so we had to open windows to sleep. The coldest our unheated home ever got for the entire winter was 68 degrees, first thing in the morning. Sure, it's Southern CA where the winter lows are typically above freezing, but it still gets into the 30s for weeks at a time. We have radiant floors installed in the foundation, but haven't hooked it up yet. Maybe that feature was overkill! This summer we have turned the a/c on one time so far - we anticipate we might need it in August but so far the warmest the home has been is around 82-83. A typical day the temperature is in the upper 70s indoors, upper 90's outside. We are controlling heat with windows and ceiling fans so far, and it has been very comfortable with the summer cross breeze flowing through the house. We built an all-electric house with 6kw solar panel system. Even with 5 people home all day with computers and electric hot water heater, etc., our annual electric cost last year was $190. The electric company charges a minimum even if the meter runs backwards (net) for the month, so the minimum yearly bill is around $65 regardless of energy use - I'd say we hit the right size configuration. Other features we love - stone facing and stone wall in the great room, dual plumbing, open floor plan, cork floors, a master bath to die for, 47 efficiency windows/glass doors for the views and sunlight, outdoor shower to hose the kids off, decks on both floors to relax, steam shower, induction cooktop with plenty of counter space and cabinets in the kitchen, large sized appliances for refrigeration/freezing/laundry. Elizabeth created an amazing design that fits us practically and aesthetically, but the real comfort and quality of life comes with the truly energy efficient home. Thanks for all of your hard work and hand holding, E!